This week, I want to rave about a movie and recommend that you all see it – well, all of you who are over 18 anyway. Last weekend was our bank holiday and I had resolved to catch up on a few DVDs as a treat to myself (I’m very easily pleased). It was perfect timing, then, when my friend Maria mentioned on Twitter a film that was currently on Sky Movies and which was excellent. I don’t have Sky Movies but I trust her judgement so I hit the DVD shop early next morning and get the film along with a few others. It would fit perfectly into my schedule for a decadent Saturday afternoon viewing when Trish was out at work. I had known of the film for some time and wanted to see it but I am lazy. Without a push or a special recommendation, this was the kind of title I could easily overlook and never see. So I am indebted to Maria for mentioning this. The film? I haven’t named it yet? Jees, it’s paragraph five already! 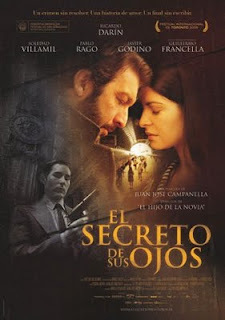 Yes, well, it’s called ‘El Secreto de Sus Ojos’ or ‘The Secret in Their Eyes’ – an Argentinean film directed and co-written by Juan José Campanella. It’s no shrinking-violet of a movie, this, it won the 2010 Academy Award for Best Foreign Language Film of the Year and swept the boards in Argentina’s own Academy Awards. Look, I never gush like this so please pay heed – this is a Wonderful film. Exciting, Intriguing, Moving, Funny, Scary, Horrific, Admirable by turns and always Hugely Entertaining. You should do yourself a favour and go and rent this film immediately – it is that good. I really don’t want to tell you anything about the set-up or the story because I saw it totally ‘clean’ and it doubtless contributed to my enjoyment of the thing. I should say that it is a murder mystery and that it contains brief but striking graphic scenes of violence and sexual aggression. I feel I need to say that so that people who find such scenes unpalatable might be warned that this is no Rom Com… except, now I think of it, it is, actually. It is that too, as well as so many other things… Oh, look, just go and see it, will you? Of course, it’s a subtitled film but that’s not going to be an issue for you, right? I’ve been thinking about the attraction of subtitled movies since my Twitter compadre and all-round-good-guy Jason Arnopp discussed the subtitling script for his new film ‘Stormhouse’ (which sounds very exciting). Ever since reading his blog post I’ve been looking at subtitles more closely. I’m watching The Killing at the moment (don’t talk to me about it until I’m finished) and, fifteen episodes in, I now feel like I can speak the language. What becomes clear is that the characters are speaking so many more words than the subtitles set down, they use each others names a lot and they say things a few times in different ways. The subtitles are clearly cutting to the quick of the matter. Perhaps I like subtitled films because they give me a clear concise entertainment as well as a different take on film to that regular Hollywood one. One of my other long weekend movies was the (for me, at least) highly anticipated Coen Brothers re-adaptation of True Grit starring Jeff Bridges. There’s been acres of stuff written about this so I can’t add much. I loved it. It is stately and authentic and understated and elegiac and moving and… many other things. It has stayed with me, in my mind, since I saw it and that’s a good thing. So what can I actually add to the archive of True Grit information? Not much, as it happens. Old Rooster, who can calmly advise a boy of his impending death, (“I can do nothing for you son,”) ultimately consummates the mutual need of both himself and the girl for a father/daughter relationship by means of an extraordinary feat of endurance in order to save her life. The tragedy of the film lies in the fact that this deep bond, once forged, is not maintained and both parties seem so much more isolated and adrift as a result of this. Subtitles irk me – when they obviously get it wrong. I didn’t find The Killing too bad because I couldn’t connect what was being said with what I was reading but Spiral and Wallander were irritating at times and I don’t like to be distracted like that. Carrie and I have yet to see True Grit. Carrie is a huge Coen Brothers fan and we have almost all their films on video admittedly. I’m not such a big fan – I’ve never been able to sit through Raising Arizona (and I’ve tried twice) – but O Brother, Where Art Thou? was interesting. They murdered The Ladykillers. I’m quite a fan of Carter Burwell though – he’s not my favourite soundtrack composer but I’ve a few CDs of his work. 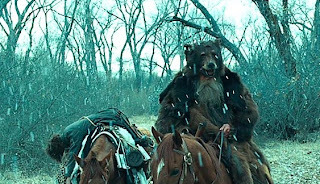 The soundtrack to True Grit is a little repetitious on its own but it’s still quite moving. The main problem is that it makes me think of The Night of the Hunter. I Got Your Letter… What Does it Say?